Obra de Agua is the First Art Exhibit of ARTQUATICA ARTISTS CIRCLE and VISUAL ARTISTS OF PARANAQUE at Alabang Country Club, Muntinlupa City, Philippines. Since I am in town for the holidays, I managed to visit the exhibit. There are numerous art works that really are amazing. All the art works are focused on aquatic and marine life. Works of emerging artists are notable in the exhibit especially the art works of our friends like Nelson Castillo – Father of Philippine Miniature Paintings, Janddie Castillo – WISIK Artist, Maricris Castillo and JC Castillo, Nante Carandang and Chris Pizarro. Among the several artworks in the Art Corridor, two art works really struck me. 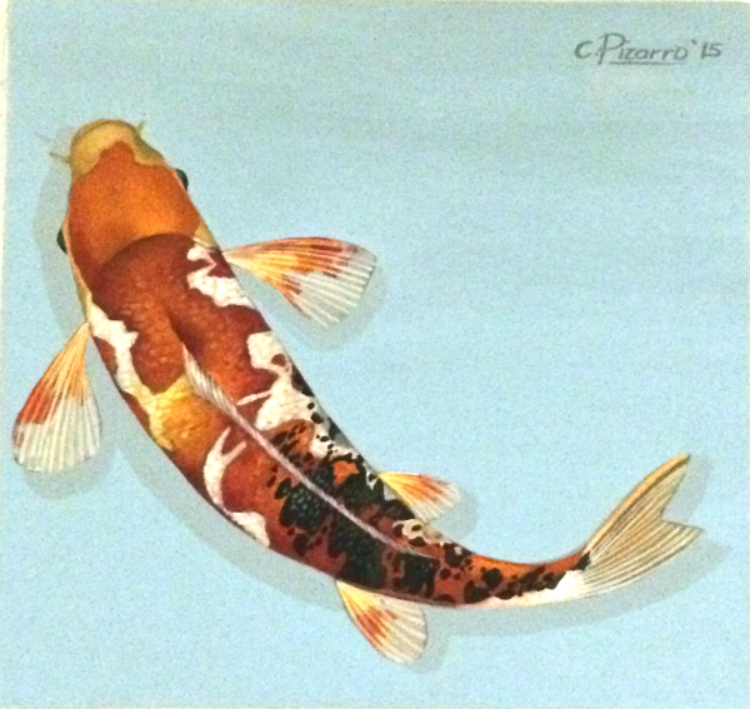 Tiger Koi by Chris Pizarro – Oil on Canvas 19 inch x 19 inch 2015. This Tier Koi impressed me because of its 3D effect. It’s vibrant colors and realistic representation of the Tiger Koi stands out from the canvas. Sky Five by Joy Jacinto – Watercolor on Paper 5 inch x 20 inch 2015. This art work features five cute fishes with bulging eyes. The art work is very simple but are simply amazing. There were four watercolor paintings with these cute gold fishes. The VISUAL ARTISTS OF PARANAQUE (VAP) is an Art Group of Visual Artists from Paranaque, Metro Manila, Philippines, who aims to help and promote the visual artists of Paranaque through various art events and exhibits. The ARTQUATICA ARTISTS CIRCLE (AAC) is a group of Filipino Visual Artist who loves to paint aquatic and marine life. Obra de Agua Art Exhibit will run till January 8, 2016. So if you love aquatic and marine life and loves art at the same time, you still have a chance to visit the art exhibit. Macuha Art Gallery is in one with VAP and AAC in promoting the Philippine Contemporary Arts and the Filipino Artist. Macuha Art Gallery through its spaces, gallery and sites showcases the art works of notable and emerging Filipino Artists.